“Go from movie buff to critical viewer,” The Film Experience invites its readers as soon as they open the cover of the book. The first pages and the preface extensively advertise the salient features as well as the innovations of the third edition of Timothy Corrigan’s and Patricia White’s introductory film textbook that was first published in 2004. The authors argue that “one cannot grasp the complete film experience without an understanding of both the formal and the cultural aspects of cinema” (v, emphasis in original), which is why The Film Experience puts a strong emphasis on gaining knowledge about the medium’s formal elements within the larger cultural, institutional, and industrial contexts that shape the viewers’ expectations of and responses to film – from production and exhibition to marketing and the star system. This book wants to go beyond a formalist approach, and therefore introduces film-historical, theoretical and political discussions that generally focus on Hollywood cinema but also include international film cultures (i.e. Germany, Italy, France, Japan, India, Iran, China etc. ), experimental and independent films as well as marginalized films by women, African American and LGBT filmmakers. Corrigan and White claim that The Film Experience “offers students a serious, comprehensive introduction to the art, industry, culture, and – above all – the experience of movies” (v, emphasis in original). In the preface, they speak once more of “the transition” or “the leap” students will make “from movie buff to critical film viewer” (v) while reading the book – almost framing the process as a conversion experience. This may seem as exaggerated as the advertising blurbs on the first pages, but The Film Experience indeed fulfills the authors’ claim to a great extent. The textbook is organized along the envisioned trajectory from regular cinemagoer to someone who engages in critical film analysis. It starts from the students’ lived film experience, provides them with film terminology, historical insight, and theoretical knowledge, and guides them towards writing analytical film essays in the final chapter of the book. The Film Experience is divided into four parts: (1) ‘Cultural Contexts: Making, Watching, and Studying Movies’, (2) ‘Formal Compositions: Film Scenes, Shots, Cuts, and Sounds’, (3) ‘Organizational Structures: From Stories to Genres’, and (4) ‘Critical Perspectives: History, Methods, Writing’. Each part contains extensively researched and very well-written chapters that are replete with examples from classic and contemporary films. After a short opening vignette, each chapter states its ‘Key Objectives’ in the introductory section. In part (2) and (3) this is followed by a historical survey (e.g. ‘A Short History of Film Editing’ or ‘A Short History of Film Genre’), before specific elements and their significance are discussed. Important key terms are printed in bold and their definitions can be looked up in the book’s glossary. The text is regularly broken up by short essays (‘Film in Focus’), image-by-image analyses (‘Form in Action’), discussion prompts (‘Viewing Cues’) as well as end-of-chapter summaries and activities (‘Concepts at Work’). The layout and full-color design of The Film Experience make it easy to read and navigate as individual chapter elements can be identified by their color codes. In contrast to the second edition from 2009, this book contains shorter, streamlined chapters and larger film frames. The image-by-image analyses illustrating key concepts are new to the 2012 edition. What is most striking about The Film Experience, however, is the way it reacts to the latest technological and media innovations and how they have changed the viewing experience: it now addresses topics such as video on demand (VOD), motion capture and 3-D technology, Twitter viral marketing campaigns and fan productions. The choice of contemporary film examples also reflects the fact that the newest edition offers up-to-date coverage of recent developments in the film industry. These examples are taken from a broad range of films, including “Hollywood blockbusters such as Inception (2010), Iron Man (2008), and The Social Network (2010) … independent fare like The Kids Are All Right (2010), The Hurt Locker (2008), and Exit Through the Gift Shop (2010), as well as popular international films like Persepolis (2007), My Name Is Khan (2010) and Ponyo (2008)” (viii). The decision to update content and examples in accordance with the latest trends and cinema schedules is characteristic for the textbook’s guiding principle to build on the students’ immediate knowledge and familiarity with their own film history. Current theatrical releases with visual effects that define the viewing habits of our times are the essential starting point to which students can easily relate and from which they will gradually explore major concepts, practices, and classic, foreign or marginal film examples that may have seemed less accessible at first. Today, many excellent film studies textbooks are available at the introductory level, often providing additional resources for students and instructors such as accompanying CD-Roms or DVDs, online video collections, chapter quizzes, summaries, writing samples or teacher’s manuals. The Film Experience offers all of these additional learning tools – but so do the last two editions of David Bordwell and Kristin Thompson’s Film Art: An Introduction. First published in 1979, this textbook has quickly become a standard in film studies. The Film Experience proudly claims to have “the best coverage of film’s formal elements” (vi), but this would probably apply to Film Art: Bordwell and Thompson’s chapters on the formal elements are still as outstanding as their use of film frames in order to convey ideas and concepts presented in the written text. Nonetheless, The Film Experience delivers adequate definitions and explanations setting a focus on how to understand the film practices and techniques, on how they create meaning. Compared to Film Art, it has also many other qualities: First, The Film Experience contains an immensely useful step-by-step guide to writing an analytical film essay (Chapter 12). Second, this textbook – unlike many others – favors historical and theoretical approaches to film that also include often marginalized racial and sexual politics. Even though the main focus is on Hollywood cinema, many examples and the entire text support the book’s critical view on how ideologies shape the film experience. Third, the book is up-to-date and therefore appeals to students, who will be able to relate the new concepts and terminology to their own knowledge about film. Overall, The Film Experience is a highly recommendable textbook for introductory courses in Film Studies as well as English and American Studies Departments because it is very accessible and lays a strong foundation for future coursework and research. While working with this introduction, then, students will definitely learn to critically reflect on their own viewing experience, but as the excellent short bibliography entitled ‘The Next Level’ at the end of the book indicates, reading The Film Experience can only be the starting point for becoming a critical film viewer. “Film in Focus” sections, for example, are always printed on a double page against a blue background, while “Form in Action” sections appear on a single page against a grey background. Each of the four parts starts with a double page printed on a black paper. See David Bordwell and Kristin Thompson, Film Art: An Introduction. 1979. 10th ed. New York: McGraw-Hill, 2012; Richard Barsam and Dave Monahan, Looking at the Movies: An Introduction to Film. 2004. 4th ed. New York: W. W. Norton, 2012; Maria Pramaggiore and Tom Wallis, Film: A Critical Introduction. 2005. 3rd ed. Boston: Pearson / Allyn & Bacon, 2011; Louis Giannetti, Understanding Movies. 1972. 12th ed. Boston: Pearson / Allyn & Bacon, 2011. Timothy Corrigan is also author of A Short Guide to Writing About Film. 1989. 8th ed. Boston: Pearson, 2011. He knows how to introduce students to taking notes, choosing a topic, developing an argument and composing a critical text about a film. 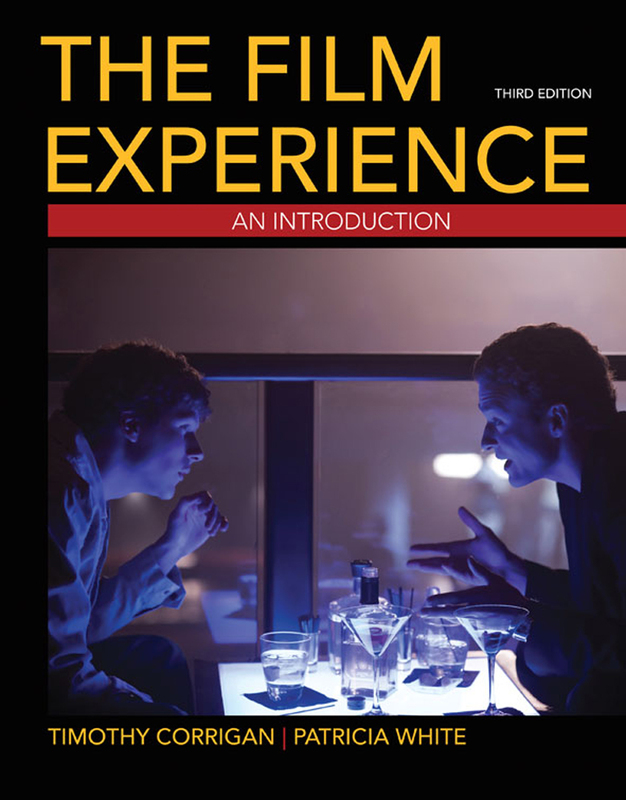 The Film Experience offers a concise version of Corrigan’s practical guide, preparing students for an analytical film essay.